Cuan is a river in Tambrauw regency of West Papua. I had a 4-day/ 3-night camping and birding tour in the river a few days ago with a tourist from Luxemburg. His name was Guillaume, a French man. I met him in Sorong city which was also the gateway to Raja Ampat. Before leaving for Tambrauw by a 4WD car, we went to traditional market to buy food that is needed for our rainforest tour. After that we headed directly to Sausapor town and then to Cuan river. 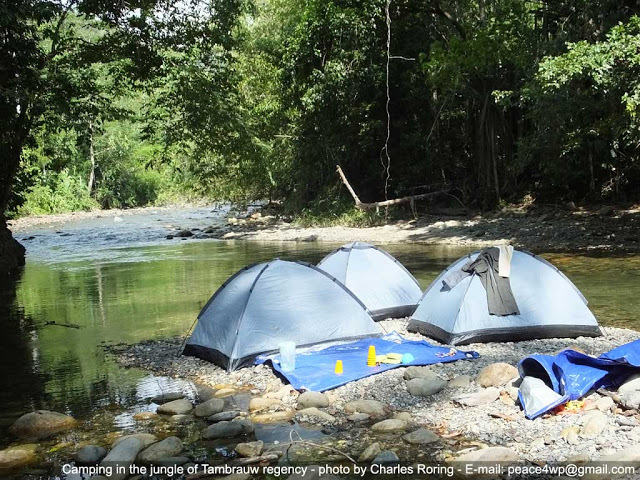 We built tents at the bank of the Cuan river and did the birding, hiking and swimming activities. The banks were flat. So, we could easily walk in the jungle to explore the rich ecosystem of the rainforest. I saw several species of birds in the forest. Birding in the Cuan river was very easy because we did not have to climb steep slopes of Tambrauw mountains. We just sit on the granite stones of the river and saw Blyth's hornbill, sulphur crested cockatoo, black capped lory, egret, friarbird and pigeons flew in the sky. In addition to birds, we also saw a lot of interesting things in the jungle. I saw a beautiful white orchids flowers on our last tour in the forest. I considered them unique because the flowers were releasing fragrant scent. I haven't been able to identify the scientific name of the terrestrial orchid plant but all I know about orchirds is that only a few that emit fragrant scent. On the way back to the road, I saw pandanus plant that was fruiting. Pandanus fruit (locally called 'buah merah') was considered as an important herbs because it contains high anti oxidants. There were colorful beetles and butterflies that I saw. One of them was a beetle or weevil that I found on the middle of the walking path while hiking in the jungle. I picked it up from the ground and examined the beetle carefully. It looked liked a plastic toy. Its name was Eupholus schoenherri beetle, I thought it was dead but later it walked slowly when I put it back on the green leave of a plant - such a beautiful insect. Perhaps you still do not have any ideas where Tambrauw regency is. Tambrauw is located between Manokwari and Sorong regencies. The capital of the regency is Fef but it is being constructed so, the temporary capital is Sausapor. If Raja Ampat is famous for its marine environment, Tambrauw regency is for its tropical rainforest. Anybody who is interested in discovering the wealth of biodiversity of rainforest, should visit Tambrauw mountains. For more info about birdwatching and rainforest tour in Tambrauw mountains, please, contact me (Charles Roring) by email to: peace4wp@gmail.com or send whatsapp text message to my cell phone: +6281332245180.